David is a big fan of my mother’s meat loaf recipe, as am I, since it is a ridiculously simple recipe for me to make. But in the interest of diversity, I thought we’d try a slightly fancier meat loaf recipe I came across in Marcella Hazan’s Classic Italian Cook Book, which added in two of our favourite things: mushrooms and cured pork. Apparently, this “juicy and beautifully flavored” recipe originated in Tuscany, whose Chianina beef is some of the best in Italy. Our beef would not be as prized (yee ha for the ground beef value pack at Costco! ), but I have no doubt as to its deliciousness. Put the dried mushrooms in a small bowl with 1 cup of lukewarm water. Let them soak at least 20 minutes. Put chopped meat in a bowl, loosening up with a fork. Put bread and milk in small pan. Over medium heat, mash it with a fork until it is creamy. Add it to the meat in the bowl, along with the onion, salt, pepper, chopped prosciutto, grated cheese and garlic. Mix gently but thoroughly by hand until all ingredients have been incorporated into the meat. Add the egg yolk, mixing it into the other ingredients. Shape meat into a firmly packed ball. Place ball on a flat surface and roll it into a compact salami-like loaf about 2-1/2″ thick. Roll the loaf in the bread crumbs until it is evenly coated. Drain the mushrooms, reserving the water they were in. Strain the dark liquid through a sieve and set aside. Rinse mushrooms and chop them roughly and set aside. In a heavy-bottom casserole, over medium heat, heat all the butter and oil. When butter foam subsides, add the meat loaf and brown it well on all sides, handling the meat carefully lest the loaf break up. When the meat has evenly browned, add the wine and raise the heat to medium high. Boil the wine briskly until reduced by half. Turn the loaf carefully once or twice. Turn the heat down to medium low and add the chopped mushrooms. Warm up mushroom liquid in a small pan and stir the tomato paste into it. When tomato paste is thoroughly diluted, add to the meat. Cook and cover at a steady simmer, turning and basting once or twice. After 30 minutes, set the cover slightly askew and cook for another 30 minutes, turning the meat at least once. Transfer meat to cutting board, allowing it to settle a few minutes, before cutting into slices about 3/8″ thick. Spoon sauce over the meat and serve. 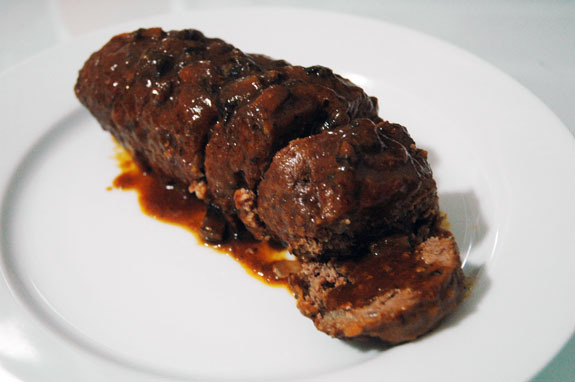 A super tasty meat loaf, with a rich, full-bodied flavour. Quite a different feel from my mom’s meat loaf recipe. It was much earthier, likely due to the portabella mushrooms. It was a lovely meal that went well with the portabella risotto David whipped up. David thought that it would be interesting to play with different kinds of mushrooms and other kinds of cured pork product.